This Best Ever Chocolate Pudding Cake is so moist and flavourful and perfect for chocolate lovers!! 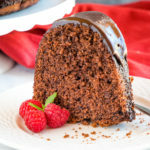 A tender chocolate bundt cake topped with a sweet chocolate ganache glaze! Add the flour, cocoa powder, cornstarch, baking powder and salt, and mix on low speed just until the batter forms and no streaks of flour appear. Melt the chocolate in a microwave-safe bowl in the microwave on 50% power for 30-second increments, stirring every 30 seconds until melted. Set aside. Whisk together the sifted powdered sugar and cocoa powder in a medium bowl. Add the whipping cream, stirring well until a paste forms. Add one or two more teaspoons of cream if necessary (this will depend on the moisture level of the powdered sugar and cocoa powder you use). Pour in the melted chocolate and whisk until a ganache forms, adding a few drops more cream as needed until the mixture pours very slowly. Pour the ganache over the cooled cake and let it drip down the sides slightly.